Congratulations! You’ve met that special someone with whom you want to spend the rest of your life. While that is a major accomplishment in itself, there are still many other decisions that need to be made. From asking for her father’s permission to choosing the right time to pop the big question, you have a lot of planning to do. So where do you begin? Start by choosing the perfect diamond engagement ring. Choosing an engagement ring is a much larger decision than it may seem. A diamond engagement ring is more than just a piece of jewelry; it’s a symbol of your commitment and journey as a couple. So it’s important to make the right decision. Luckily, this guide can help. While it may be difficult to put a budget on your love, it is important to be practical about what kind of ring you can afford. You don’t want to lock yourself into a situation where you are spending the first ten years of your marriage trying to pay off the engagement ring you purchased. Traditionally, the standard is for a man to spend the equivalent of two month’s salary on an engagement ring. This should serve as a solid starting point for choosing the right diamond engagement ring, but know that you are always free to choose a different approach. Another budget-conscious decision you have to make is whether to purchase a custom ring or buy a pre-made design. By choosing a custom diamond engagement ring, you can expect to pay a little more, but you will have a ring that was specifically created for your special someone. One way to get the best of both worlds is to choose to purchase your diamond engagement ring from an online jewelry store because it eliminates the need for sales representatives. You get to be in complete control of the buying process and save money on your purchase. When it comes time to start shopping for the perfect diamond, it’s important to keep budget fresh in your mind. Your budget will help guide you through making all the important decisions associated with cut, clarity, color, carat and shape. The 4 C’s of diamond-buying should be the main criteria you use to choose diamond engagement rings. Whether shopping in a store or online, you need to understand the importance of cut, color, clarity and carat. A diamond cut refers to the angles and proportions a diamond craftsman uses to create a polished diamond for engagement rings. There are a variety of different diamond cuts to choose from, and the different cuts will alter the look of your finished product. Cut In most cases, these diamonds lack the ability to reflect a sufficient amount of light. They are usually shallow or deep cut and can be found at discounted prices. A diamond’s color refers specifically to the presence of any color in your diamond. The important thing to understand about diamond color is that a perfect diamond is colorless. You do not want to choose a diamond that is cloudy or slightly yellowed. The closer a stone is to being colorless, the more valuable the diamond becomes. Colorless diamonds are very rare and more valuable because they allow much more light to pass through the stone. There is an alphabetical scale used to represent a diamond’s color. This scale was developed by the Gemological Institute of America (GIA). The top of the scale, representing a colorless diamond, is graded with a D, while the lowest end of the scale, resulting in a brown or yellow diamond, is a Z. Ideally, you want to purchase a diamond in the D-F range, as they are nearly perfect and very valuable. However, if that type of diamond does not fit in your budget, a diamond rated G-J will contain slight color, but nothing that is visible to the untrained eye. Diamond clarity solely depends on the presence or absence of tiny inclusions, or birthmarks, which occurred when the diamond was forming. Inclusions can affect the amount of light in the diamond, reducing its sparkle. F-IF Diamonds falling in this range usually have no internal inclusions. These diamonds are very rare and also the most highly valued. VVS1-VVS2 These diamonds feature very small inclusions that are nearly impossible to detect, even under magnification. Diamonds in this category are a very practical option for saving money without sacrificing quality. VS1-VS2 These diamonds feature minute inclusions that are not visible to the naked eye and sometimes difficult to see even under magnification. SI1-SI2 The diamonds that fall in this grade range feature inclusions that are visible under magnification and slightly visible to the eye in some cases. I1-I3 These diamonds feature inclusions that are easily seen with magnification and visible to the naked eye. This one is the biggie. While all of the 4 C’s are important, for your significant other and her friends, it’s all about the diamond carat size. You can bet that is one of the most common questions her friends will be asking. But as an informed shopper, you know that the carat actually refers to the weight of a diamond, and not its size. So how do you choose the right carat size? It actually depends on a variety of factors. If it’s important for you and your bride-to-be to purchase a higher quality diamond, you may want to choose a smaller carat to accommodate your budget. However, if you know carat will be the most important factor for your special someone, you may want to select your ideal carat size and adjust the other 4 C’s to better match your budget. The important thing is to find a delicate balance between carat weight and brilliance. Getting a certificate with your diamond is vital. It’s the blueprint of your loose diamond. It shows all the exact properties of your diamond including weight, cut and quality. If you ever have your diamond stolen or misplaced, your diamond certification will facilitate its replacement with a diamond of comparable quality. 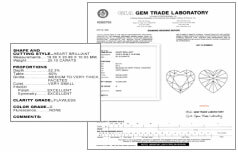 While a diamond certificate is not a guarantee, appraisal or valuation, it is an important document that can help you understand more about your diamond. While learning about how to choose a great diamond is helpful, it still doesn’t get to the heart of how you will choose your diamond engagement ring. You want to choose the ring that fits your girlfriend’s personality, style and taste. Shopping diamond engagement rings is a personal experience, so keep that in mind. Diamond shape is one of the best ways to customize your girlfriend’s diamond engagement ring. With so many unique styles to choose from, it should be easy to find one that suits your bride-to-be. All of the 4 C’s still apply when you are choosing a diamond shape, but you have more options to choose from. Diamond bands are also an important part of the diamond engagement ring process. You can choose between a variety of metals and manufacturing methods to further customize your diamond engagement ring. Based on other jewelry your girlfriend wears and her unique style, you should be able to choose the perfect engagement ring band. Each metal has its pros and cons; the important thing is to choose a metal that will best suit your special someone. Odds are you know your girlfriend better than anyone else. She’s your best friend and your soul mate, she’s the reason you’re buying a diamond engagement ring. So it’s important to enter the engagement ring shopping process with confidence. Trust that you know your girlfriend and that you will be able to choose the perfect ring for her. Keep in mind the 4 C’s and remember all you’ve learned about shape, metals and bands. Finding a traditional or online jewelry store that offers engagement ring experts will help you choose the perfect ring. Don’t be intimidated by the process and don’t feel pressured by the salespeople, take your time, ask questions and find the right ring at the right price. Danforth Diamond is committed to helping educate consumers on how to choose the perfect diamond engagement ring. As a retailer of affordable diamond engagement rings, they understand the diamond-buying process better than anyone.